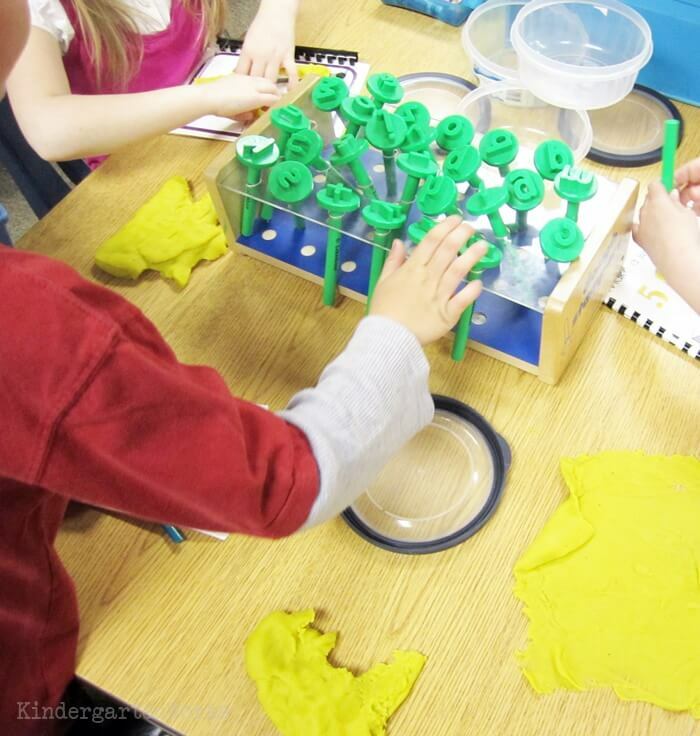 You can create a playdough literacy center that lasts all year long. 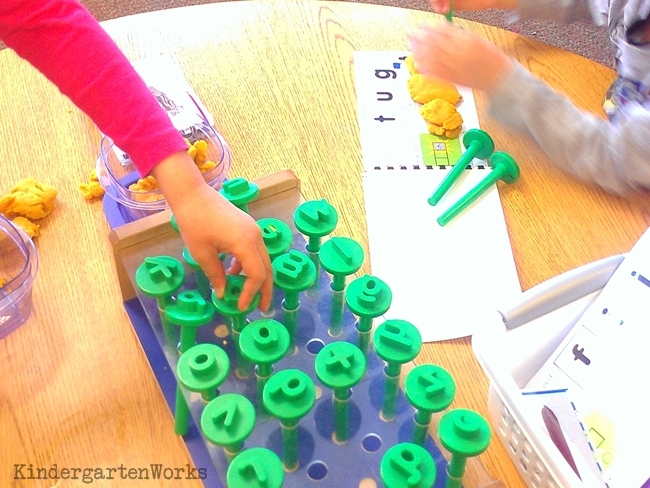 This is how I set up, organized and maintained a playdough word work center in my kindergarten classroom. It’s my belief that students learn faster and are more successful when they can manipulate things. This same belief applies to literacy skills. When students can manipulate objects (not just handling paper or worksheets) it feels more like play and is more age-appropriate. 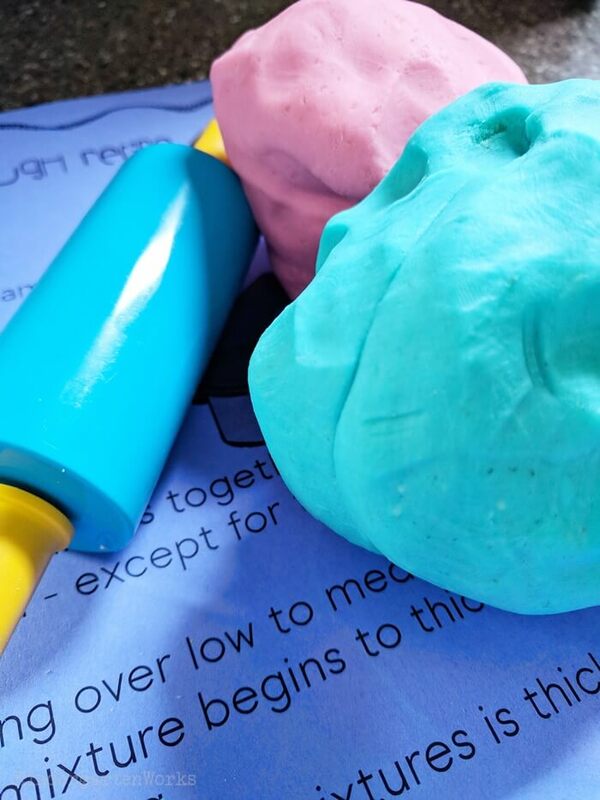 It begs the question – how much more manipulative can you get than play dough? 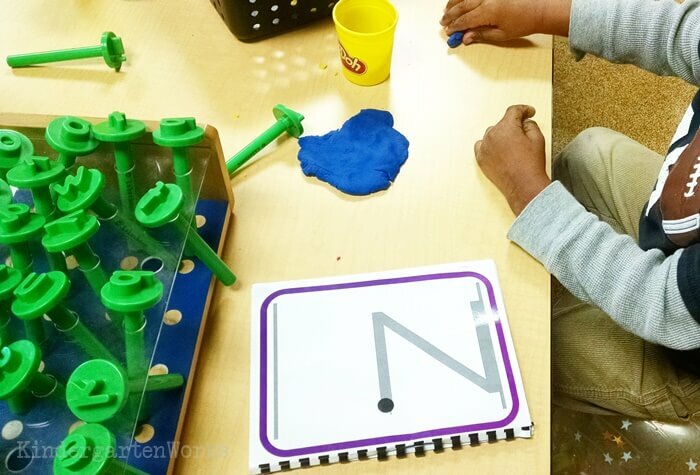 I was determined to create a literacy center that taught students some key things… and not just how to play with playdough (which I knew if not carefully constructed, they would default to). So – let’s get to it. Let’s set up, organize and maintain a literacy center that uses playdough as the key component to improving word work skills! Students access and use all materials correctly, independently. Students clean up this center without any teacher intervention. 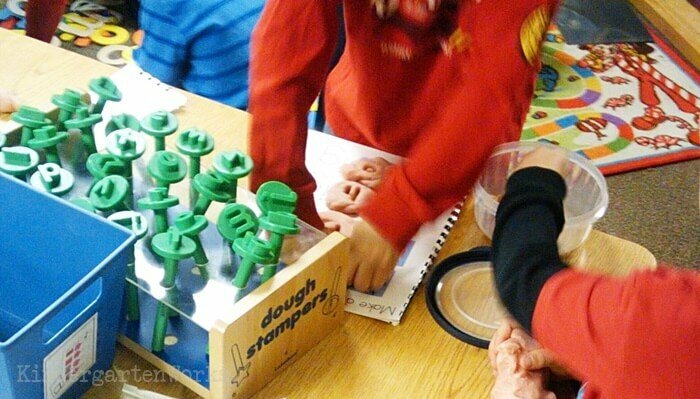 Students learn while manipulating playdough using guiding workmats, cards, and playdough tools. Remember – the reason we create literacy centers is so that students can continue to learn on their own so that it allows you, the teacher, to meet with students in small groups. So, the set up for this playdough center needs to be simple, age-appropriate and also offer choice. If you don’t offer students choice – you end up with behavior problems, lack of motivation and students won’t differentiate work for themselves. Let’s start with the directions and offering choice. I put all of the options (though I don’t teach every option at once) onto a literacy center poster. The star at the top of the poster indicates that students have a choice as to which activity they pick when they come to this center. Each of the activities listed is standards-based. 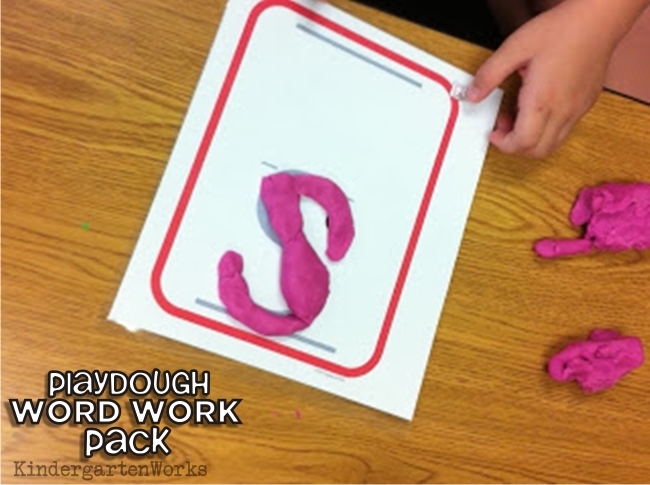 It’s included in the Playdough Word Work Pack. This poster and the picture icons help me to teach exactly what to do (and what not to do) at this center so that all students can use the materials correctly and – ta-daaah – independently. If you give a kid just playdough, they’re gonna play. Which is alright during choice time, but not what we’re going for during literacy centers. So, you need to give them guidance without you being there. The answer is workmats or work cards. 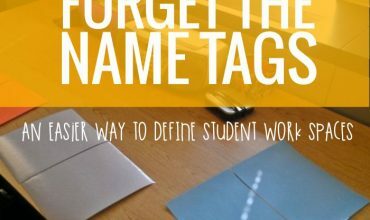 Using laminated work cards and workmats lets students stamp or put playdough right on top of the guide so they can stay focused. 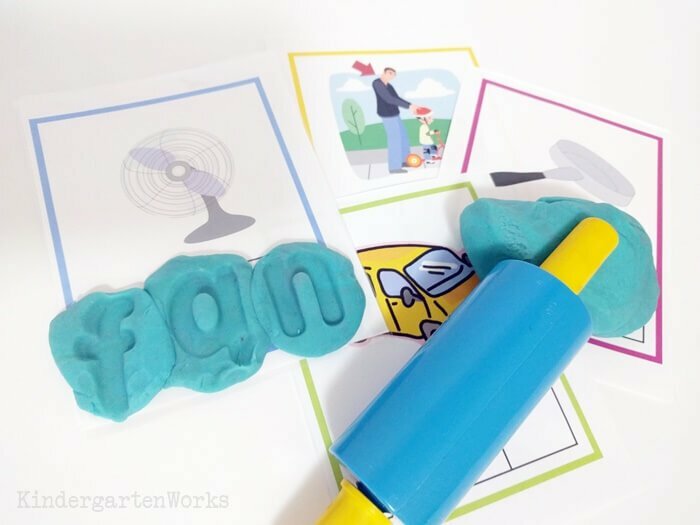 I created five different activities for students to use while at the playdough word work center. You can have them too! 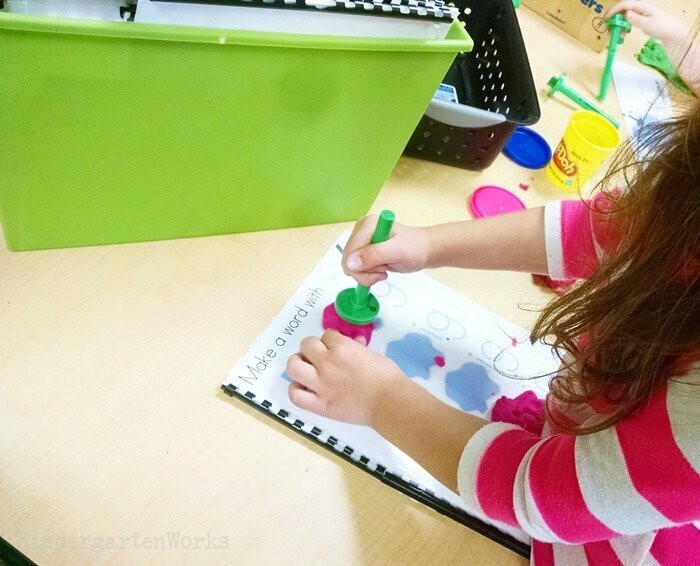 The most simple activity to introduce at the beginning of the year is forming letters. Kinders use the workmats to form the letters using playdough “snakes.” Black and gray dots show how many strokes and where to start. Having such a broad range of skills that students can work on means that they can use playdough all year long. One of the best purchases I’ve made! Great for practice, very well made and a HUGE bang for your buck! – Stacie M.
Can’t wait to use this! I love how it grows with the students! – Kami N.
So fun for my students to use during stations. I use different parts all through the school year. – Laura D.
This is my students favorite center to visit! Just print and laminate! – Deborah W.
Now let’s look at other tools help focus this center on learning. Remember to keep the center simple – but offer the correct tools so that students can do this center and learn without you. 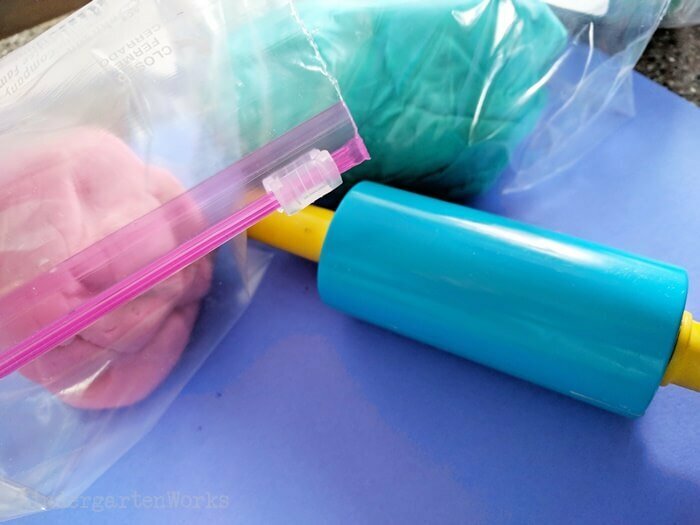 Students can always flatten playdough with their hands, but using a small rolling pin (affiliate link) can make the work more fun. But skip any playdough shapers, knives or shape cookie cutters for this center. That sends a mixed message on what they can do at this center. 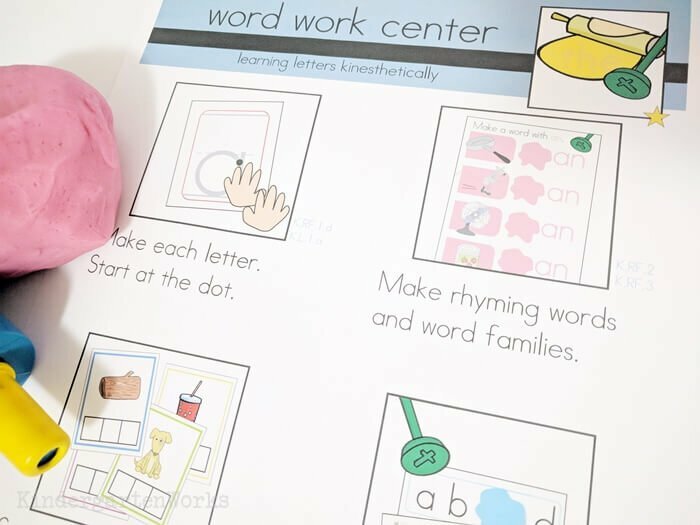 You only need lowercase letter stamps to make this center last! I want my students to focus on lowercase since that’s what they’ll see most often in print. These Lakeshore letter stampers are great quality. Here is another kind of playdough letter stamp I’ve found on amazon (affiliate link). For cleaning up – you might not need much at all. Teach them how to use a ball of playdough to stamp up other small pieces for quick clean up. If it’s part of what you teach up front, then they will model that too. If tables seem gritty afterward, teach students how to use wipes (if your school has them on supply) or a spray bottle with 1-2 drops of dish soap and a paper towel to clean their tabletop workspace. They are totally capable of doing this without teacher help. Model it, teach it, expect it. The key to organizing a playdough literacy center is to make it age-appropriate. You’ll love that it doesn’t take much for this center to come together. Remember – the goal is the use of tools and clean-up without teacher intervention. So, whatever you choose, make it simple so that students can do it on their own. I liked to use a basket for workmats and work cards. I liked to bind cards or mats together to make sets. I personally liked to use 4 tupperware to hold the playdough in separate tubs for students. Pick ones that are easy-open, easy-shut. But you could easily use zipper-top baggies too. We had a letter stamp holder from Lakeshore, but those aren’t available anymore. I found this replacement playdough letter stamp stand that’d work pretty well. Tip! If you let students transfer their work onto a clipboard (or dry erase board) it becomes a portable way to share and show off their work to the class during share time. I’m not one for making new centers all the time. That’s why I try to work smart. I want this playdough literacy center to last all year long. I don’t mean completely set it and forget it – but a little maintenance can make the work we do to teach a center go a long way. Here’s how I believe we can keep the center from feeling stale for my kinders, yet, makes it smart work for me. So, with this particular center, I would introduce forming letters first, followed by ABC order work cards. But I’d only put out a handful of letters and a small set of ABC order cards to begin. Other than adding or replacing cards and keeping a fresh playdough stash – once you’ve made this center – it’s pretty much ready to go. I feel like it’s worth mentioning how I make this center open-ended. Someday I’ll write a post about how if you have “fast finishers” or kids saying, “I’m done. What do I do next?” then you’re doing it wrong… but for now, let me explain how I set up this literacy center (as I do for all of them) to be open-ended. First, students keep working at their literacy center until I signal it’s time to clean up. This means they stay and continue working. What do they do until the time is up? The choose which activity from the directions poster they want to do. If they tire of that one activity, they simply pick another. 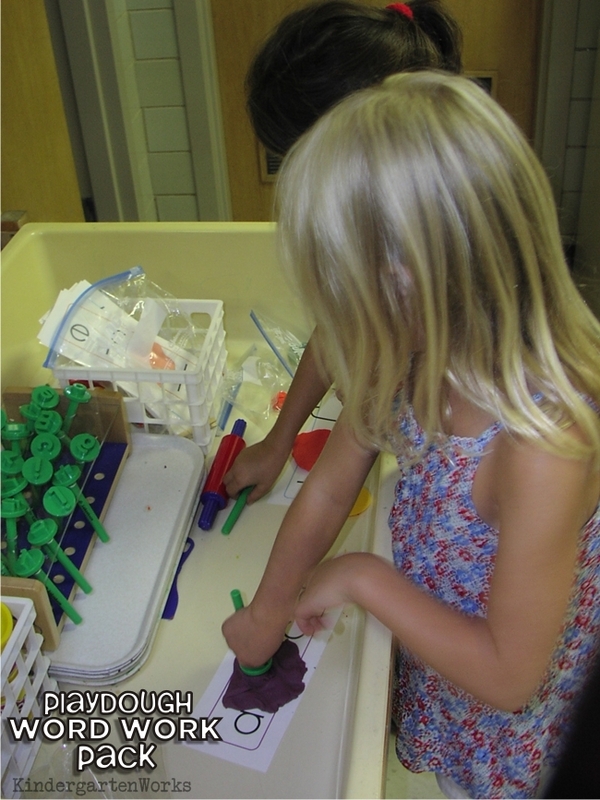 Often students will gravitate towards their own comfort level of activity in the playdough center. Students who need to work on letter names and sounds will stick with the letter formation cards and ABC order cards. Students ready for more will work on more. But if you have some higher level students – or have students ready for more, then I’ve got your back. 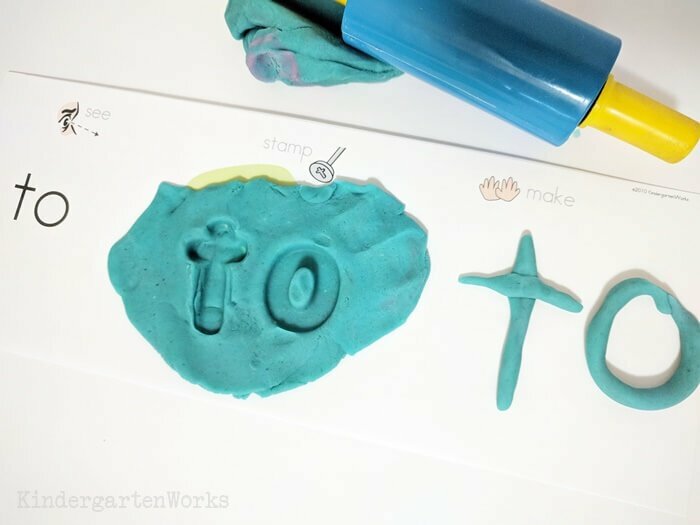 I’ve created a playdough extension pack that has more sight words, focuses on manipulating letter sounds in short words and letter fluency. We usually used the extension pack after Christmas. Some students may want to stamp out sight word sentences, like, “I like my dog.” I always gave that type of extending-their-own-learning my stamp of approval. With my students reading on a second-grade level, I had them stamp their own individual spelling lists in the dough in place of sight words. Homemade playdough was always my go-to way to keep this center stocked. Usually, we had parent volunteers make the playdough for us – which was amazing. A fresh, new batch of playdough was always a highlight. 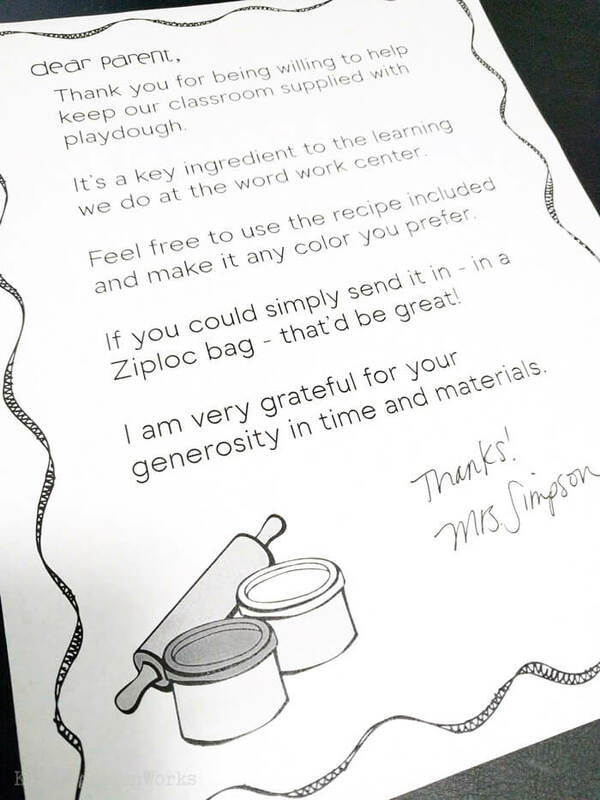 To make it easier on you (and your parent volunteer) here is a quick, free printable you can use to thank your volunteers and give them a recipe that is perfect for the classroom. 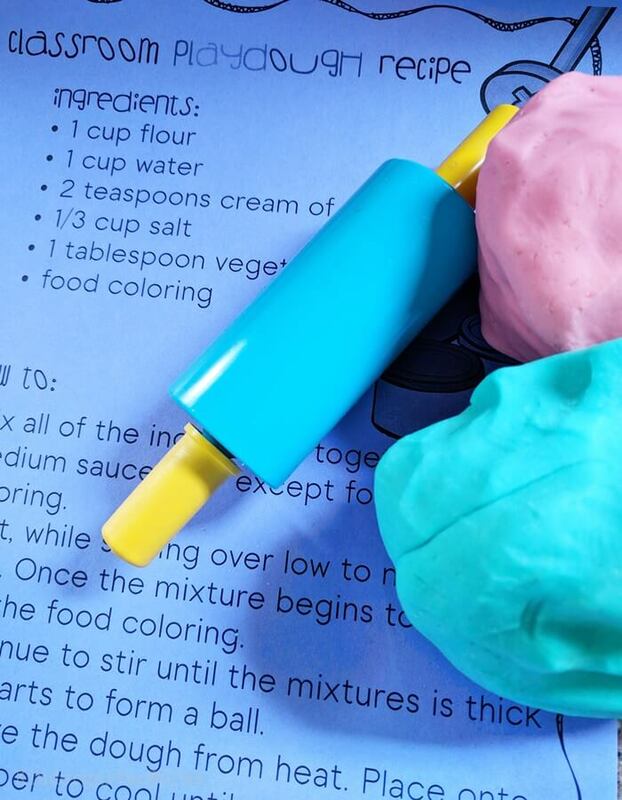 This playdough recipe for the classroom will hold up for at least a month of being played with every day. You can always add a little water to help rehydrate it. It’s a great recipe and just perfect for your word work center. One batch is enough for 2-4 kinders to share. You can easily store it in Dollar Tree tupperware or opt for zipper-top slide baggies. I only ever had out one color at a time – just to make it easy – but do whatever works for you. Are you ready to get playdough into your classroom and take learning to an independent, hands-on level? 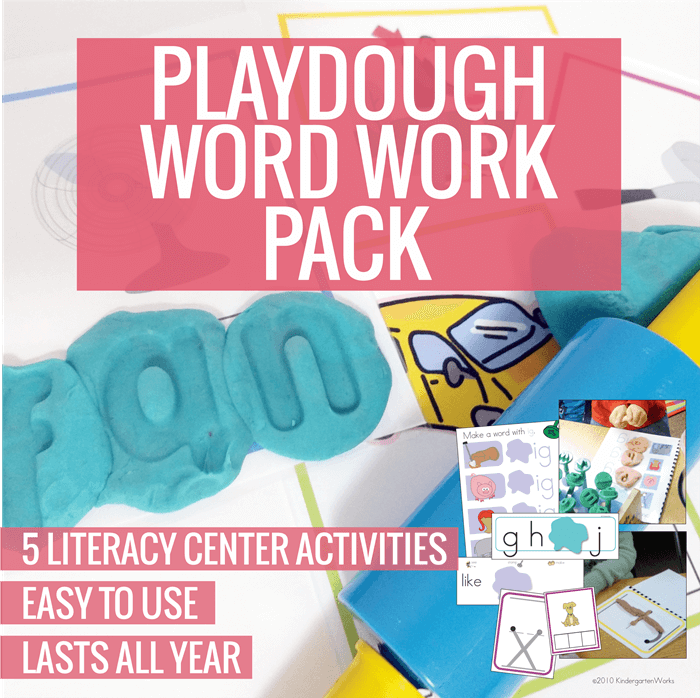 Then snag your Playdough Word Work Center Activities Pack today. 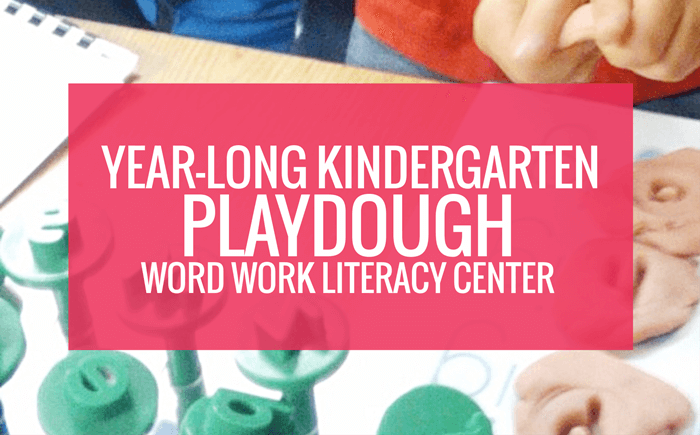 There you have it – how I set up, organized and maintained a playdough word work center in my kindergarten classroom. You can do it too! Thanks Lauren – I hope your kinders love them like mine do! I love these activities! I just bought them and can’t wait to share with my students!!! I LOVE YOUR CLIPART!!!! Where do you get it from?? On page 4 – click on the image for the CVC stamping word sheets (bottom row, middle picture). That should take your directly to the download so you can see what I created for personal use within my classroom. Let me know if you need any more help via e-mail ([email protected])! I can’t find the spell the 3-letter word sheets. I bought and downloaded the set on tpt but don’t see them. Am I just missing them? Wow – thanks Kristen! 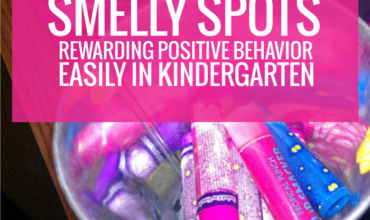 So glad you love it – my kinders do too! I sent you an e-mail tonight. We’d love to be a part of what you share with your followers. Fun! I’ve packaged the materials together on TPT based on your requests. Thanks ladies! 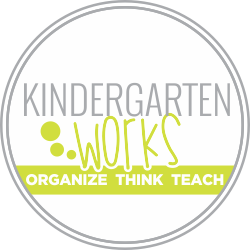 Here is the entire pack – enjoy and we’d love to see pictures of your kinders learning!